First official Season 3 trailer! New Season 3 photos, and a trailer coming soon! 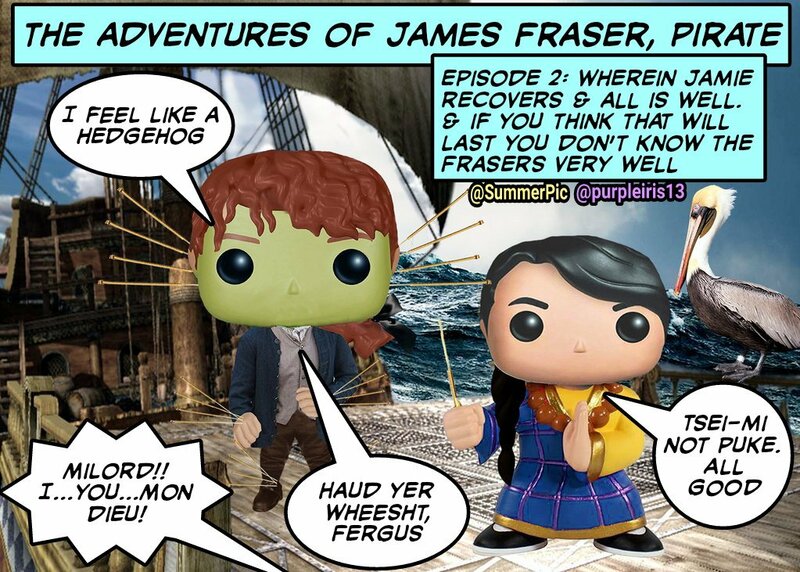 Season 3 Preview: VOYAGER PopToons! 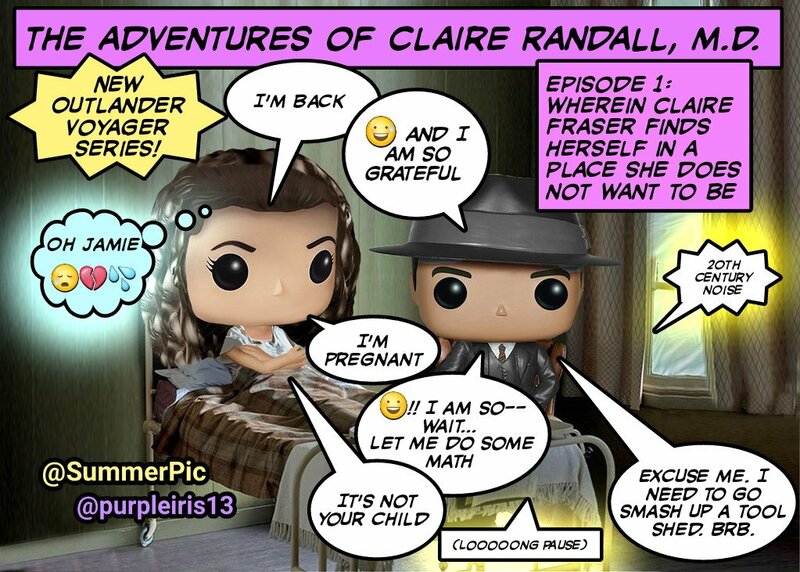 If you haven't read VOYAGER (Book 3 of Diana Gabaldon's OUTLANDER series), there are spoilers below! This post also contains spoilers about the first episode of OUTLANDER Season 3. Read at your own risk. If you've read the OUTLANDER books, you know that Jamie Fraser woke on the battlefield at Culloden with Black Jack Randall's corpse lying on top of him. The body of a man lay across his own. Its dead weight crushed his left leg, explaining he absence of feeling. The head, heavy as a spent cannonball, pressed facedown into his abdomen, the damp-matted hair a dark spill on the wet linen of his shirt. He jerked upward in sudden panic; the head rolled sideways into his lap and a half-open eye stared sightlessly up behind the sheltering strands of hair. It was Jack Randall, his fine red captain’s coat so dark with the wet it looked almost black. Jamie made a fumbling effort to push the body away, but found himself amazingly weak; his hand splayed feebly against Randall’s shoulder, and the elbow of his other arm buckled suddenly as he tried to support himself. He found himself lying once more flat on his back, the sleeting sky pale gray and whirling dizzily overhead. Jack Randall’s head moved obscenely up and down on his stomach with each gasping breath. 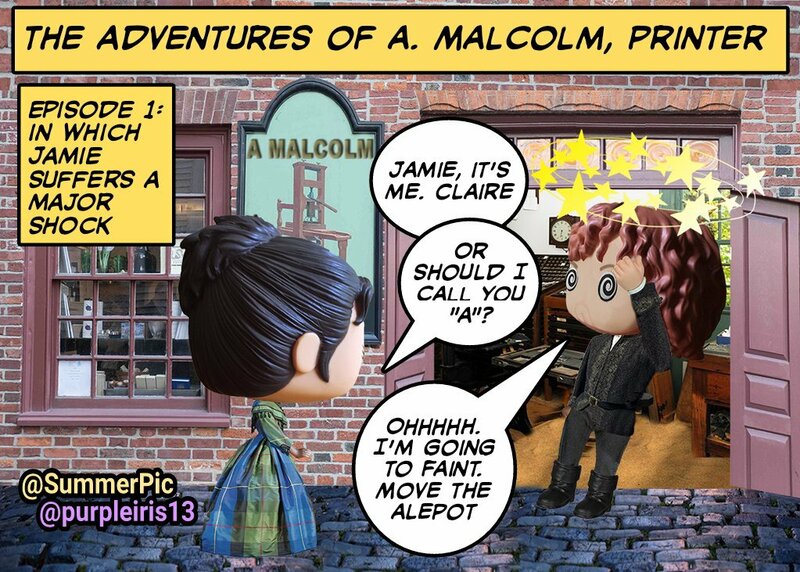 Jamie knows Black Jack Randall is dead--but not how. Did he kill him? If so--how, in what frame of mind? In the grip of the Red Thing, as he might kill any enemy in battle? Specifically, coldly, knowing who it was he killed? In vengeance? From mercy? From simple necessity? He doesn't know, and thus has only his own forgiveness as a shield. But he both wants the truth and fears it--and his memory is coming back. Fans have speculated about this for more than twenty years. What exactly happened on the battlefield that day? 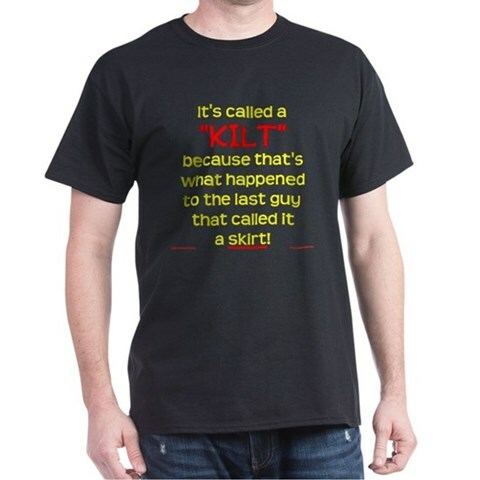 It's one of the great unresolved questions of the OUTLANDER series. 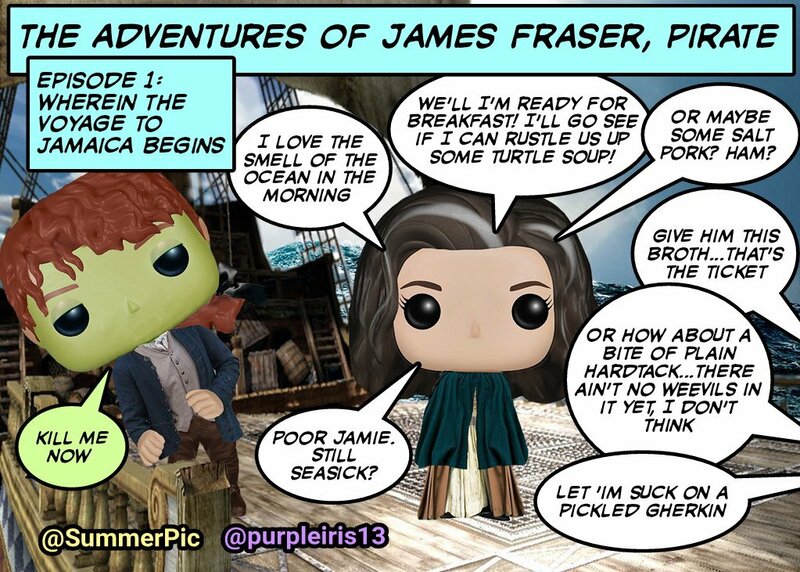 With OUTLANDER Season 3 premiering in September, we're going to see a version of these events play out on screen. We know that they filmed the Battle of Culloden, and according to multiple people involved with the show, we will see that battle in the opening episode of Season 3. Diana Gabaldon has said that she has written a scene for Book 9 (GO TELL THE BEES THAT I AM GONE) in which we find out What Really Happened at Culloden. She shared that scene with Ronald D. Moore and Maril Davis prior to the filming of that episode. 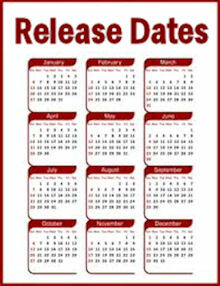 So, is the film version identical with the 'real' version? No. It's been adjusted for television <g>, in terms of visual drama--it's not nearly as messy and violent and grunting and confused as the real thing, but neither is it a sell-out or betrayal of What Really Happened. It just does what the show always does--separates the elements of the original, plays some up and some down (occasionally omits things for time or dramatic flow--that wasn't done here), and gives you a reasonably good visual account of the original, though somewhat condensed and refracted. I do want to put it on record though, that I wrote What Happened _before_ the show executed their version of it. This poses a real dilemma for fans of the books, including me. Will you watch the TV version of events, knowing that we won't get to read Diana Gabaldon's version until BEES comes out, possibly in 2018 or 2019? Will you skip the battle scenes in Episode 301, and wait for the Definitive Version of Events as told in BEES? Or do you fall somewhere in between? Here's my take on it. The version of What Happened at Culloden that we see on TV will be (like everything else in the show so far) the writer's/director's/actors' interpretation of events, not necessarily exactly the same as what actually happened. In my opinion, the only definitive version of what happened will be in the book -- in Diana's words, told exactly the way she wants to tell it. I'm sure the battle as seen on TV will be visually exciting, very dramatic, well-acted, and riveting to watch. 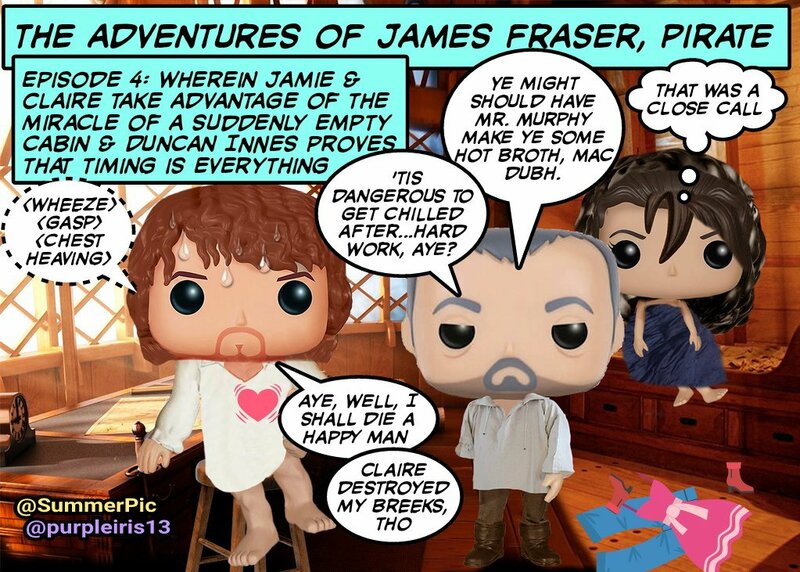 <g> But I would be willing to bet that seeing it on TV won't have nearly the same emotional impact as reading about those events from Jamie's POV in the book, overlaid with his 30-plus years of remembering only fragments, wanting to know more, but fearing those memories at the same time. STARZ has released the first official trailer for OUTLANDER Season 3! I think it looks terrific! What about the rest of you? Today is the 271st anniversary of the Battle of Culloden, which took place on April 16, 1746. 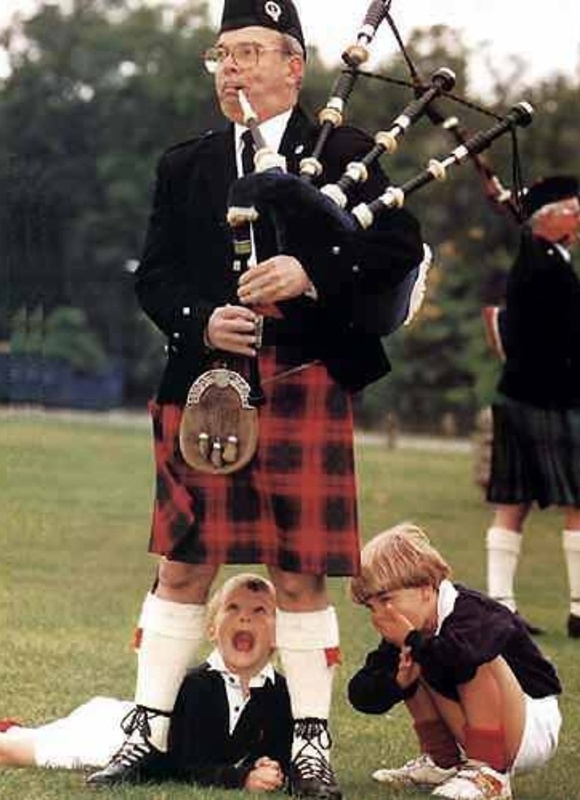 If you haven't read VOYAGER (Book 3 of the OUTLANDER series), there is a Major Spoiler below. Read at your own risk! 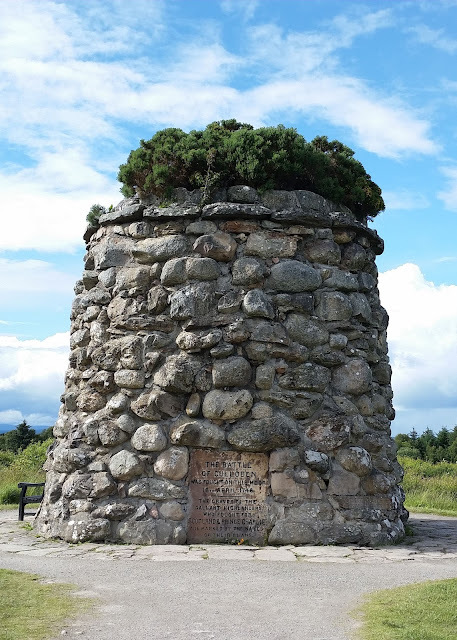 I was lucky enough to be able to visit Culloden in 2012, and again last July. It's an amazing place, and the Visitors Centre is very well done. 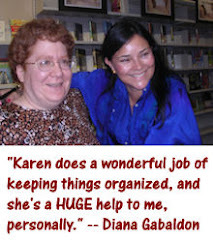 Here are a couple of Easter-related quotes from Diana Gabaldon's books, just in time for the holiday. 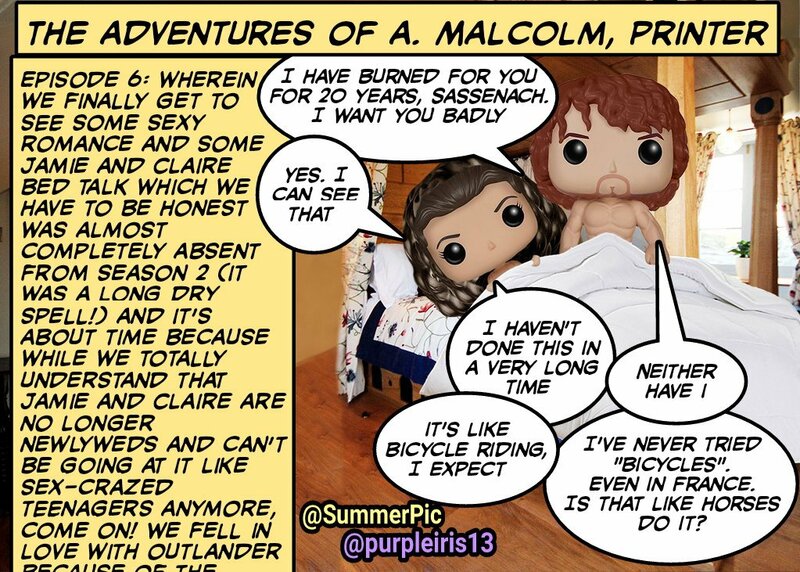 If you haven't read all eight of the OUTLANDER books, there are spoilers below. Read at your own risk. [Roger's] heart rose, in spite of his anxiety, when he came to the top of the pass and saw Lallybroch below him, its white-harled buildings glowing in the fading light. Everything lay peaceful before him: late cabbages and turnips in orderly rows within the kailyard walls, safe from grazing sheep--there was a small flock in the far meadow, already bedding for the night, like so many woolly eggs in a nest of green grass, like a kid’s Easter basket. The thought caught at his throat, with memories of the horrible cellophane grass that got everywhere, Mandy with her face—and everything else within six feet of her—smeared with chocolate, Jem carefully writing Dad on a hard-boiled egg with a white crayon, then frowning over the array of dye cups, trying to decide whether blue or purple was more Dad-like. 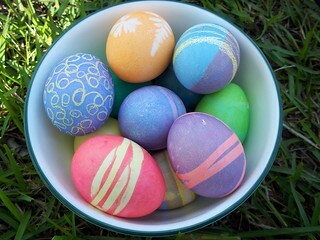 I'm Jewish, so I don't celebrate Easter, but we did occasionally dye eggs when I was little, just for fun, and this bit makes me smile, remembering that. "The church was all dark,” Jamie continued, “but the folk coming for the service would buy small tapers from the crones at the doors. It was something like this”--I felt, rather than saw, his motion at the sky above--“a great space above, all ringing wi’ the silence, and folk packed in on every side.” Hot as it was, I gave an involuntary shiver at these words, which conjured up a vision of the dead around us, crowding silently side by side, in anticipation of an imminent resurrection. 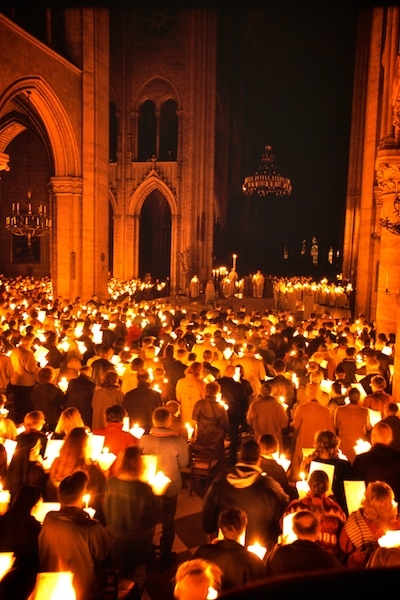 Happy Easter to all of you who are celebrating today! STARZ released two new photos from Season 3 yesterday! Click on the photos to enlarge them. STARZ also announced that the first official Season 3 trailer will be shown on Sunday night (April 16) before the premiere of WHITE PRINCESS at 8pm ET/PT. I'll post the video as soon as it becomes available. Stay tuned! 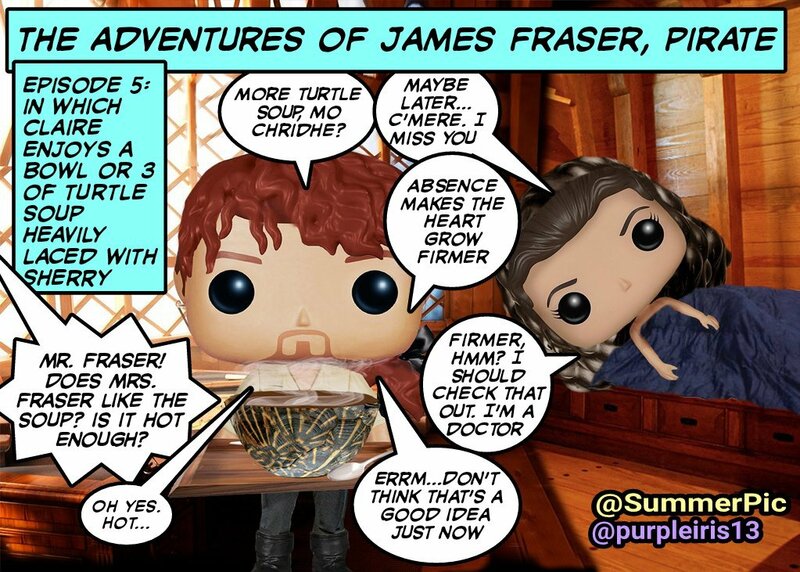 As we continue to wait for OUTLANDER Season 3, I thought many of you would enjoy this series of "PopToons", telling the story of VOYAGER. I think they're hilarious, and very creative! Credit (and many thanks!!) goes to @SummerPic and @purpleiris13 on Twitter. 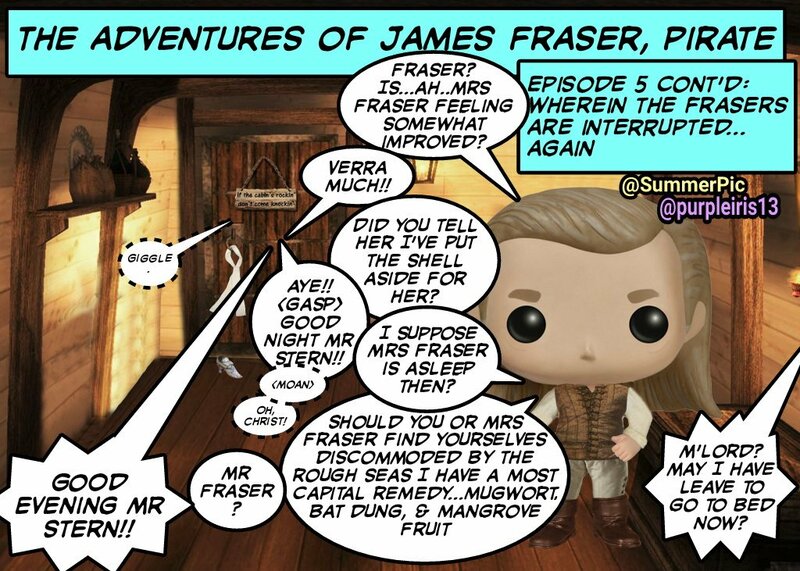 If you haven't read Diana Gabaldon's VOYAGER (Book 3 of the OUTLANDER series), there are Major Spoilers below! 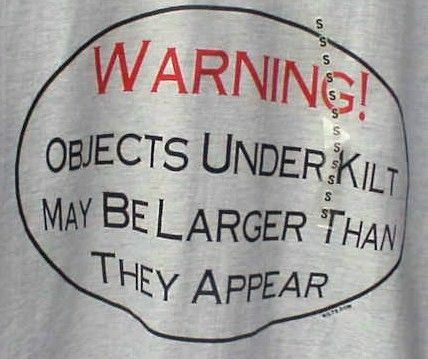 Continue at your own risk, and don't say I didn't warn you! OK, enough of that, on to the REUNION!! 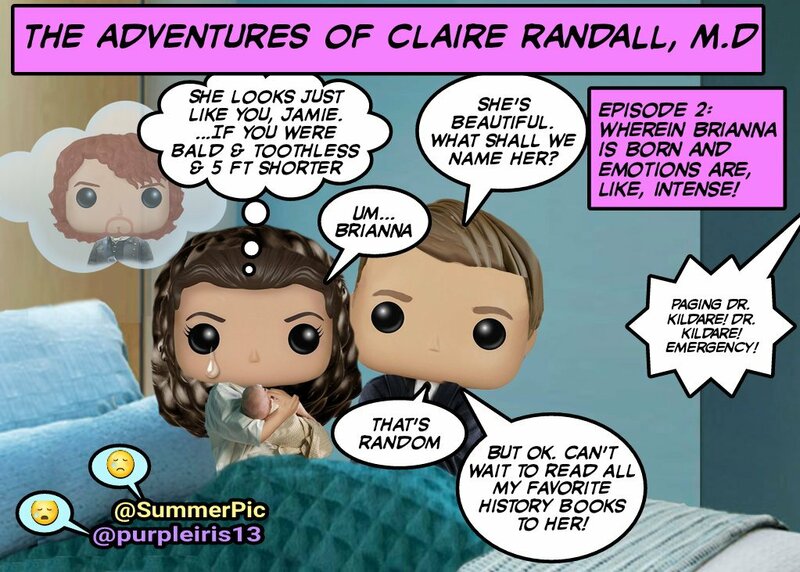 If you like these, check out @purpleiris13 and @SummerPic on Twitter for more! 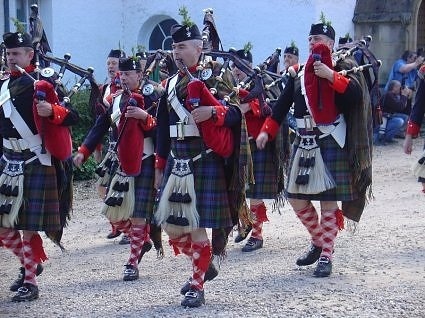 The very tall man on the right in the photo below is Simon Fraser, clan chief of the Frasers of Lovat. 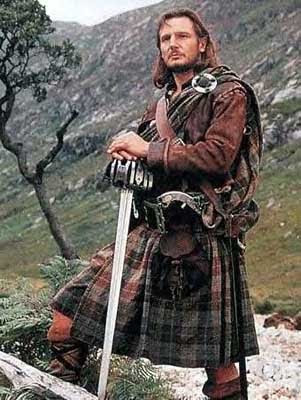 Diana Gabaldon met him in Scotland a few years ago. 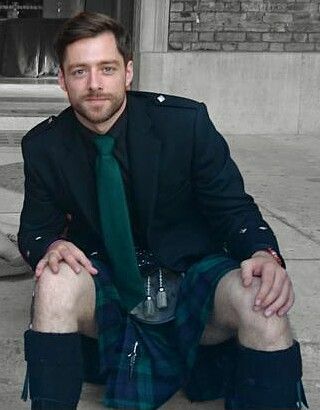 Here's Richard Rankin, who plays Roger Wakefield on the OUTLANDER TV series! 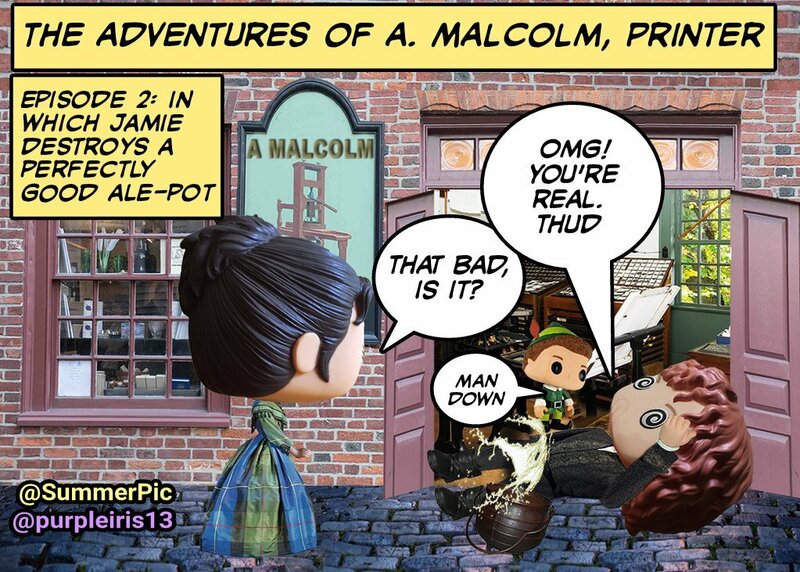 Here's the deleted scene from Episode 114 ("The Search") where Jamie demonstrates how he puts on his kilt. 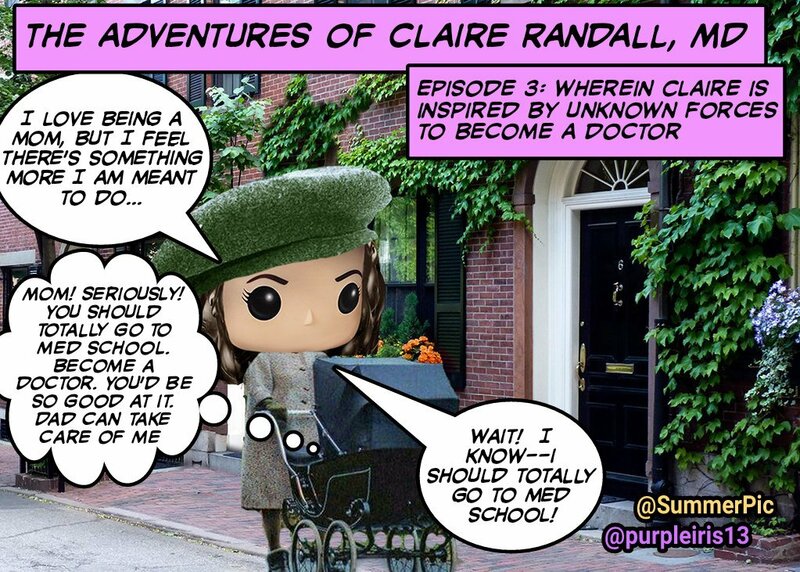 Here's Part 1 of Diana's account of her trip. I'm sure she'll post more as time permits! 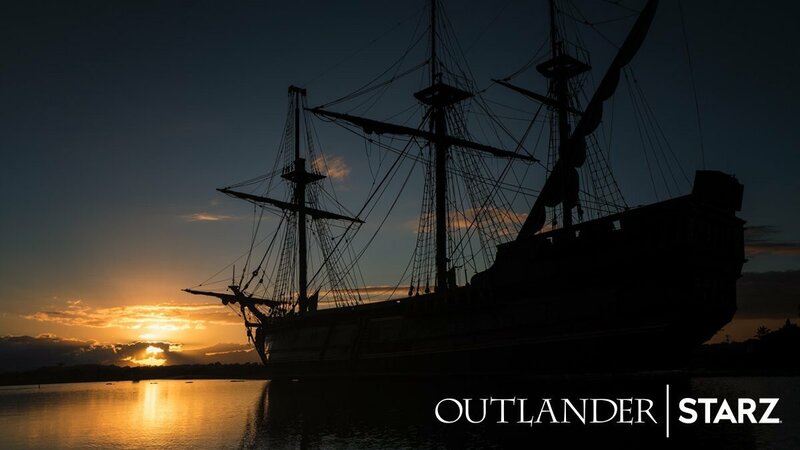 The photo above was taken by Matt Roberts, one of the OUTLANDER writers. (Click on the photo for a bigger view.) Isn't it beautiful? 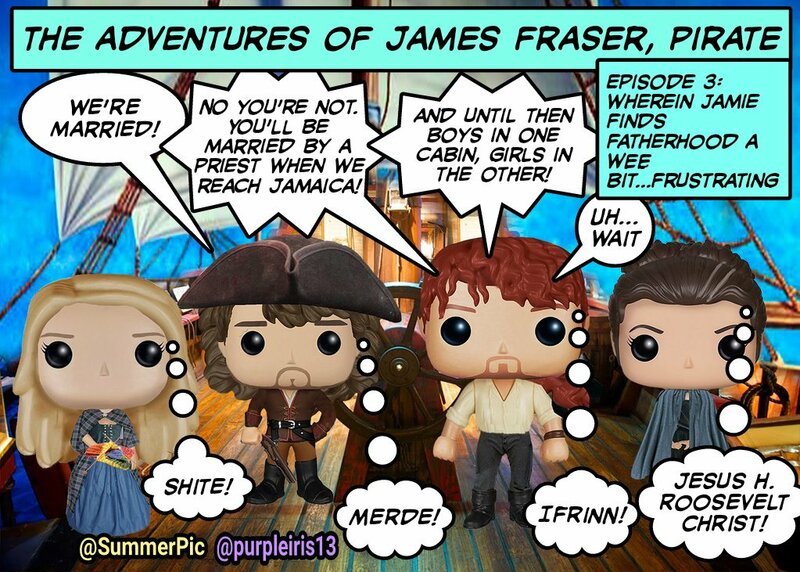 Have you tried to get other people to read or watch OUTLANDER? Diana Gabaldon often says that these are "word-of-mouth books, because they're too weird to describe to anybody." This month's poll asks the question, "Have you tried to get other people to read the OUTLANDER books or watch the TV series?" Please take a moment to vote. I got my sister addicted to the books a few years ago, and I certainly have done my bit as an "OUTLANDER ambassador", helping to spread the word about the series in all its various forms. 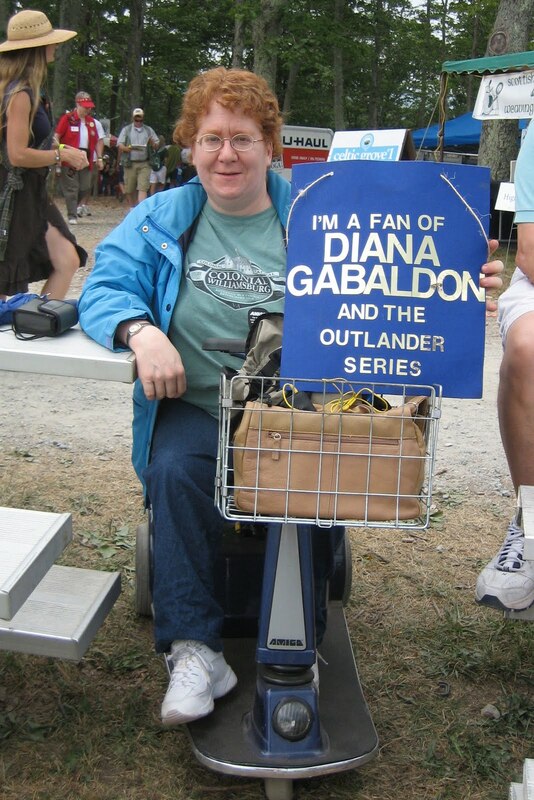 Here I am in 2010, on my first visit to the Grandfather Mountain Highland Games in NC, with a handmade OUTLANDER sign. What about the rest of you? 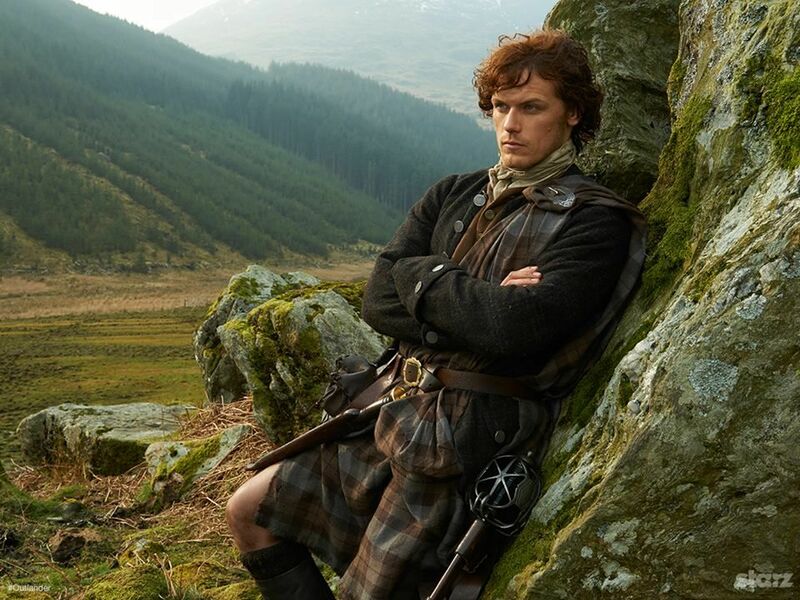 If you've had some success with getting people hooked on OUTLANDER (books, TV show, or both), please leave a comment here or on my Outlandish Observations Facebook page, and tell us about it. 35.53% - All of the above. 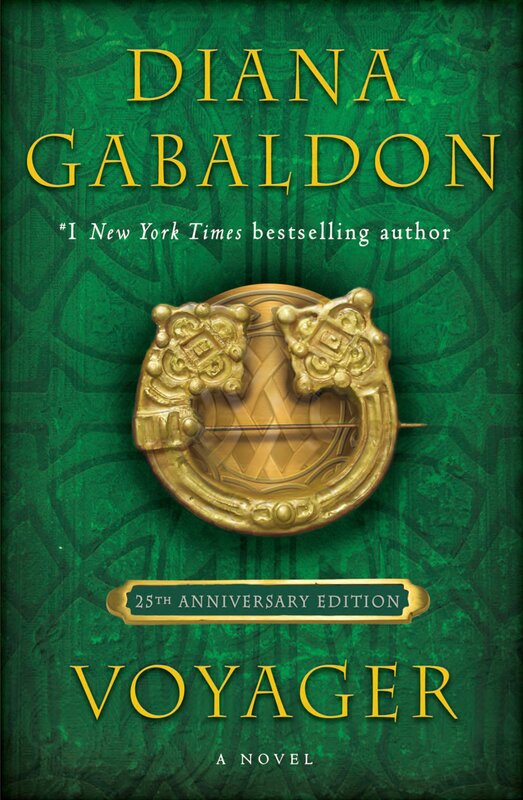 17.76% - Reading (or re-reading) Diana Gabaldon's books. 7.46% - Listening to the OUTLANDER audiobooks. 7.46% - Reading books by other authors. 6.36% - Watching Seasons 1 and 2 again. 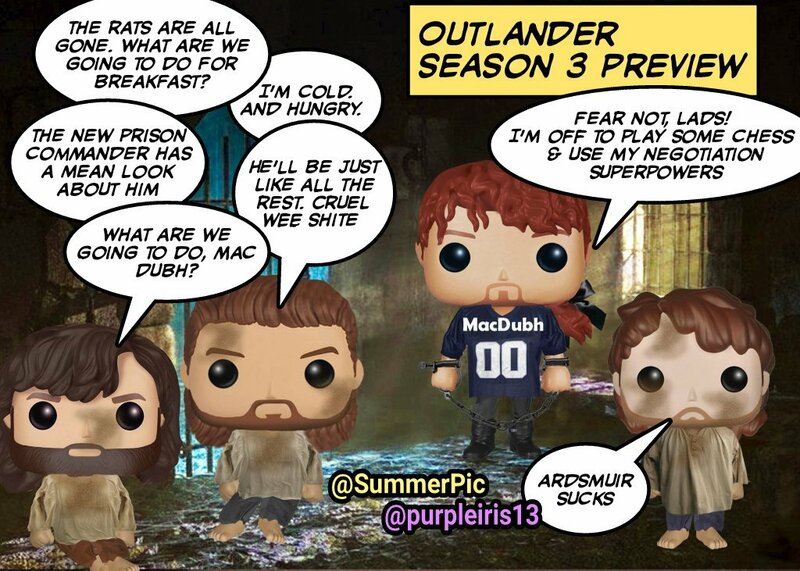 5.48% - Following various OUTLANDER fan-sites, including Outlandish Observations. 4.82% - Devouring any information I can find (trailers, photos, interviews, etc.) about the TV series. 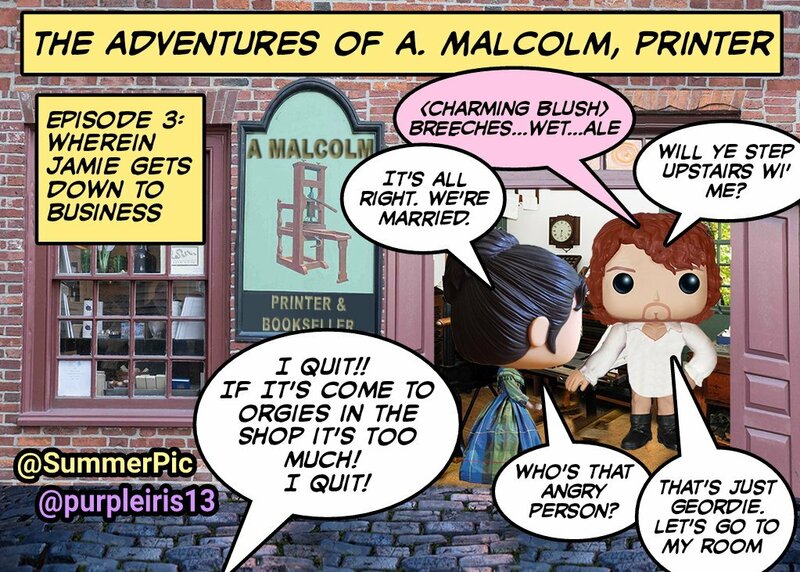 3.51% - Pursuing other hobbies or interests not related to OUTLANDER. 3.07% - Focusing on family, work, or other commitments. 2.41% - Hanging out on Diana Gabaldon's Facebook page or Compuserve. 1.54% - Trying to get other people to read the books or watch the TV series. 0.88% - I'm not interested in the OUTLANDER TV series. watching, re-reading, listening, following websites, buying book one for others. Re-reading the books verrrrry sloooowly! This is my hobby, my very first ever. I just finished re-reading all the books, and watched all the episodes again! Not all, but many of the above. Rewatching seasons 1 and 2 as well as rereading the books. Writing blog posts for "Scotch & Scones"
There were 456 responses to this month's poll. Thanks very much to everyone who participated! 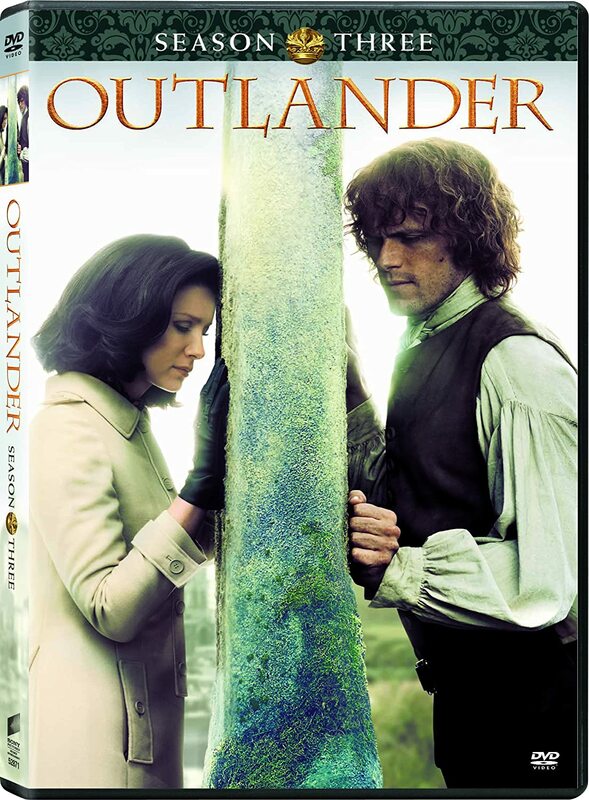 Please take a moment to vote in the April poll, which asks the question, "Have you tried to get other people to read the OUTLANDER books, or watch the TV series?" Thanks!